Li, 56, is one of the models on "Yi Embroidery Street" in Yongren County, southwest China's Yunnan Province. She was employed by the county government last year to showcase clothes made by the Yi people, an ethnic minority, in Yongren's Zhizuo Village. The village is one of the poorest areas in the country. "When I'm on stage, I'm the happiest girl in the whole world," Li said. "On stage, I get to show our unique clothes that we designed and made ourselves, which boosts sales on the street." The street is part of a government effort to lift the villagers out of poverty. 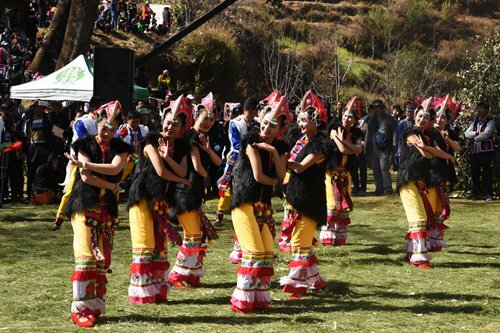 Seeing the potential of the embroidered clothes and using the village's thousand-year-old tradition of fashion shows, the government set up the street in the county center, employing people from Zhizuo to showcase their garments. The government also offers free street stalls to help the Zhizuo people sell clothes. Since the street opened to the public in early 2017, more than 1.77 million tourists have visited. "Life is getting much better these days," Li said. The fashion show tradition originated more than 1,300 years ago in Zhizuo Village, about 70 km away from Yongren county seat. The village has more than 2,000 registered residents, mostly of the Yi ethnic minority. "Women in the village have always been very good at embroidery," Li said. "There is a saying in our village: If you can't embroider your own wedding dress, you'll never find a husband." At the beginning of every lunar new year, locals wear ethnic clothes and stage a "costume contest," which has evolved into the fashion shows in recent years. The event is also an occasion for trading among locals, as well as an opportunity for young people to find partners. At such events, a host wearing a mysterious hat starts by burning incense and bowing to ancestors. Men wearing tiger-headed clothes then blast horns, signaling the start of the fashion show. "There are usually five groups of models: the Grandpa Team, Grandma Team, Men's Team, Women's Team and Children's Team, and they take turns to walk onto the stage," Li said. "We wear the most unique clothes made by women in the family." People as old as 80 and children just a few years old participate. "I started taking part in the fashion shows when I was 5," Li said. After the contest, locals organize other activities, such as stilt-walking and tug-of-wars. Despite its passion for fashion, the village has long been mired in poverty. Zhizuo sits deep in the mountains of Yunnan, and transportation is very difficult. In 2006, the first highway connected the village with the outside world. In recent years, many Zhizuo people have left for big cities to make a living, leaving behind the elderly, children and women. Some thought about selling embroidered clothes to make money. "The images embroidered on the clothes are unique," Li said. "We embroider birds, flowers, ox heads, butterflies and tiger heads." Tiger heads are a traditional totem for the locals. "But it was too difficult to find buyers because Zhizuo is a remote place," Li said. "We had no knowledge of e-commerce." To help locals escape poverty, the county government decided to use the fashion shows to bring in visitors. A blitz of promotions featuring the "costume contest" and "Yi embroidery" have been launched in recent years, drawing great attention. In 2016, Chinese model Mary Ma caught wind of Yi embroidery and added Yi elements to her clothes presented at the 2016 China Fashion Week. Last year, the government set up the "Yi Embroidery Street." Every Saturday night, Yi models like Li Ruxiu are invited to show off their clothes on the catwalk. The villagers then hold their "costume contest" ceremony, which begins by paying tribute to ancestors and ends with the fashion shows. The decision proved to be a good one. Visitors swarmed in and business in the street soared. By February 2017, the revenue from Yi clothes sales reached 6.65 million yuan ($1.1 million). Riding on the back of the catwalk success, the government launched the "Yi Costume Contest Week" and a "Weekend Costume Contest" in Yongren. The contest has been put on the provincial intangible cultural heritage list. "I am just happy that our tradition has helped many Yi people out of poverty," Li said. "I hope our fashion shows will be better and more international in the future."